FREE STAMPS for a year!!! Happy Sunday everyone!! I hope you all had a great weekend! We got snow here in North Carolina and my kids had a lot of fun playing in it yesterday! Ok, enough of the chit chat! Let's get down to the.... FREE STAMPS FOR A YEAR! How you ask? Just name this bear! Alma at The Cat's Pajamas is holding a contest to see who can name this newest addition to the TCP family! Do you think you have THE name for him? Just email your entry to contest@thecatspajamasrs.com by February 8 and if the name you chose is picked, you will win stamps from TCP for a year!! All the details can be found here. 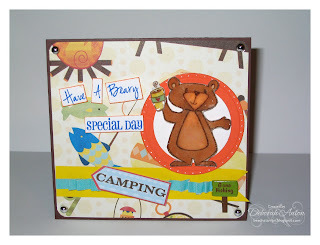 In this card, the bear, sentiment, and coffee cup from A Beary Good Year (releases Feb. 9) was used. A fun versatile set! You will not be disappointed! DP from K&Co, "No Fishing" Brad from Eyelet Outlet, and Nestibilities. Mr. Bear is embossed and cut out along with his coffee and popped up. Finished the card up with self adhesive metal dots. I know! You probably thought I fell off the earth... but I didn't! It had been a very hectic end of 2009 between my dh deploying to Iraq and getting my children settled with our "new life" of just the three of us. One of my son's had what the school thought was a learning disability, but was recently tested (finally) and we have found that he does not; just something minor that will easily be fixed through some help by the teacher and myself. Then the holidays approached! I took the kids to see family in the states for Thanksgiving and then we headed to Holland for Christmas as my sister had a baby. We had a lot of fun! I got back from Holland and a week and half later, I was off to CA for CHA!! Man!! What a blast! It always is... it is nice to see old and new friends and of course see some of the fantastic products getting ready to go on the market!! I will post some pictures tomorrow of CHA. I didn't take a lot, but if you want to see some now, head over to Cammie's blog and see those. She and I went together and we took about the same pictures!! LOL! 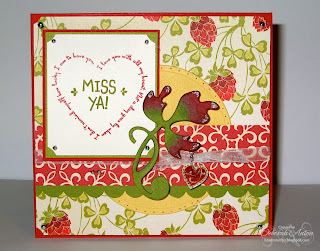 I wanted to make my "comeback" with sharing with you a card made using The Cat's Pajamas stamps for the TCP Tuesday Challenge. I just love this set! Especially the one I used for this card. Check out the challenge here and you can win $25 in TCP products! I have recently gotten into making some 4.5x4.5" cards lately which is the size of this one. I used some dp by Scenic Route and a flourish chipboard which I colored with my Copics. The little heart "charm" is stamped with one of the hearts in the TCP set which I embossed in clear and cut out. The main panel and main image are popped up. It was wonderful getting back into it!! I will have another TCP card to show you later (if you don't mind another post) : ) with a little bear who needs a name!! Can you help? If you can and pick a winning name, you can win stamps for a YEAR!!! Who doesn't like that?? Stay tuned!! Thanks so much for stopping by and thank you for the patience of seeing my next creation! I have many more to share but need to post. (I had to keep up with my DT!) Have a great Saturday! !